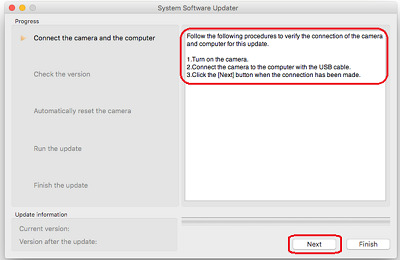 Unless stated otherwise, the file listed below must be installed BEFORE the Action Cam System Software Update (Mac) in order for it to work properly. If more than one Required file is listed, install them in the order presented on this page. Note: If you have the RM-LVR3 Live View Remote accessory, it will also be necessary to install the RM-LVR3 update as well. On the camera, press the UP or DOWN button to select MENU, then select SETUP, then select Ver, and then press the REC/ENTER button. 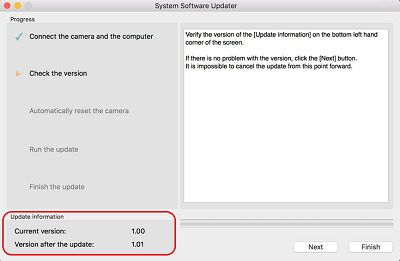 If version number displayed is 1.01 or higher, your device does not need this update. Note: If Ver. 1.00 is displayed, download and install the firmware update. This firmware update and any changes incurred by it are permanent. It's not possible to return to a previous firmware version after updating this firmware. By continuing this update process, downloading and updating this firmware, you acknowledge that you are aware and understand that this update cannot be reversed. The device may not operate properly if the power is interrupted during the update. Don't allow the computer to enter Sleep (Standby) mode during the update process. To change these settings, refer to your computer manual or consult the manufacturer. USB cable: Use the USB cable supplied with the device. Download the Update_HDRAS300V101.dmg file to a temporary or download directory (please note this directory for reference). Go to the directory where the file was downloaded and double-click the Update_HDRAS300V101.dmg file. Note: Do not connect the device to the computer until instructed. Double-click the System Software Updater icon. 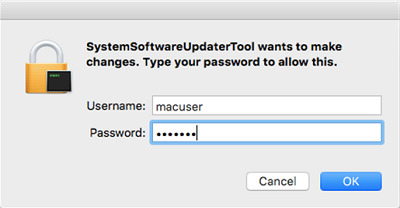 At the SystemSoftwareUpdaterTool wants to make changes prompt, enter the Username and Password for the administrative account, and then click OK.
At the System Software Updater screen, confirm the following information, and then click Next to continue. Connect the device to your computer using the supplied USB cable. If the message Could not find the device for this update appears on the computer display, try disconnecting and reconnection the USB cable or try another USB port on the computer. Sometimes when the device is connected to the computer with the USB cable, a message appears to restart the computer. If this occurs, remove the battery pack from the device, restart the computer, reconnect the battery pack, and then start the firmware update procedure again. 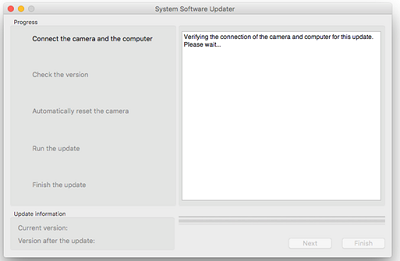 When the updater recognizes the device connection, the next System Software Updater screen is displayed on the computer, and the device screen displays the following image. 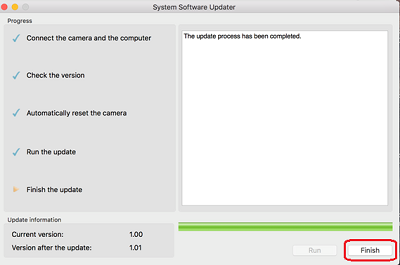 At the System Software Updater screen, check the version number at the lower left. If the current version is lower than 1.01, click Next. Note: If the current version is 1.01, your device does not need this update. 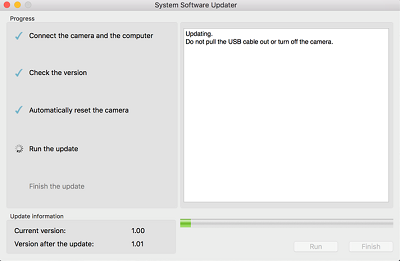 Stop the USB connection and then click the Finish button on the System Software Updater screen. The device will automatically reset, the following screen will appear on the computer and then the update will automatically start. Note: The update process takes about ten minutes to complete. Do not power off the device or disconnect the USB cable until the update process is complete. When the update is completed, the device will automatically restart. Make sure the device is turned on and wait until the LCD screen appears again before continuing. At the System Software Updater screen, click Finish. If Ver. 1.01 is displayed, the firmware update was successful. If Ver. 1.01 isn't displayed, download and install the firmware update again.